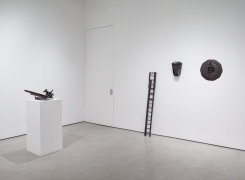 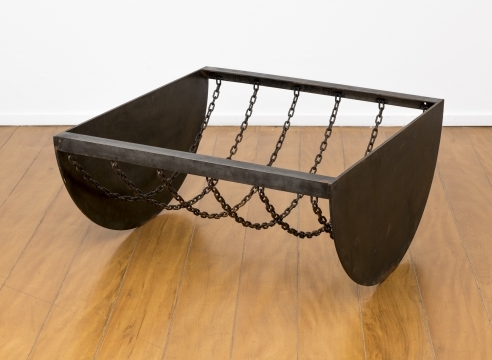 Alexander Gray Associates presented Melvin Edwards: In Oklahoma, the artist’s fifth solo-exhibition at the Gallery, featuring recent sculptures. 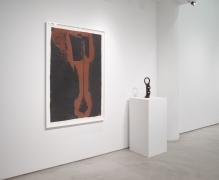 This exhibition brought together the artist’s first new body of work since his 2015 retrospective Melvin Edwards: Five Decades, and revealed his knowledge of global history related to Africa and the diaspora as a thematic touchpoint to enrich his abstract aesthetic. 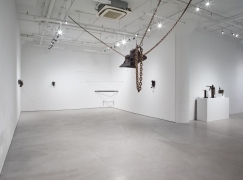 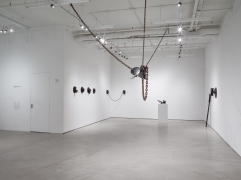 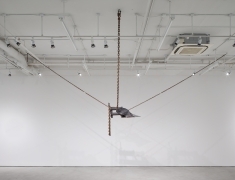 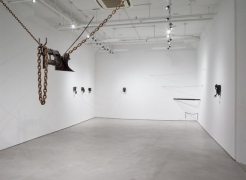 This interest reveals itself through his vocabulary of familiar forms, including chains, tools, and barbed wire, as well as his titles that associate collective history with personal narrative. 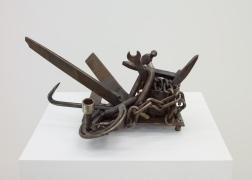 Much of the work on view was created during Edward’s 2016 residency with the art center, Oklahoma Contemporary, made with materials that he sourced in metal scrap yards in Oklahoma City. 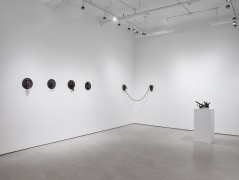 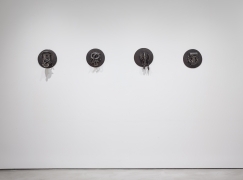 The resulting works—installations, sculptures, and wall reliefs from his acclaimed “Lynch Fragments” series—carry evocative titles that conjure lived experience, references to place, and African diasporic connection. 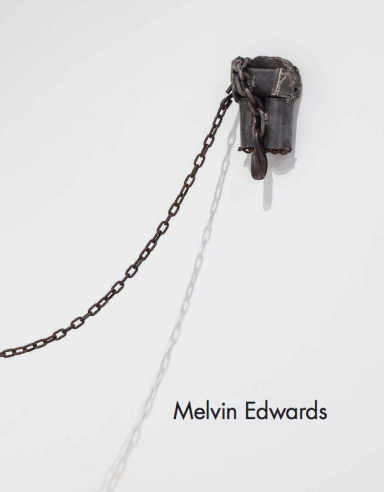 In this new body of work, Edwards pays homage to the significance of Twentieth-Century Oklahoma, and its neighboring Texas; key gathering points for African American communities during the Great Migration (1910–1970). 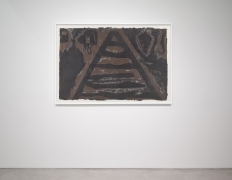 The landscape and social conditions of rural Texas are a subject he frequently reflects upon, specifically the “communities [that] developed right after slavery,” of which his family was a part. 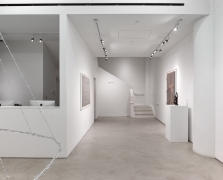 The artist’s own moves throughout his lifetime—from Houston, TX to Dayton, OH; back to Houston and then to Los Angeles in 1955; and since 1967, New York—are marked by significant moments of communal migration of black Americans, and the shifting status of race relations specific to each place. 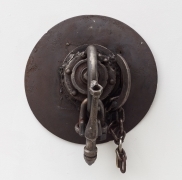 On view on the second floor was Agricole (2016), a large segment of a plow head suspended from the ceiling by chain. 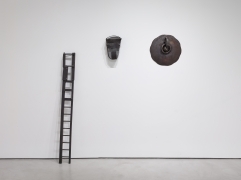 With his use of agricultural tools, Edwards recalls memories of Texas, where the generation of his parents, teachers, and role models—the storytellers of his youth—transitioned from rural to urban living. 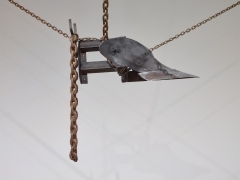 Through his use of recognizable metal elements, Edwards invites multiple associations; metal sourced in local scrap yards evokes industrial history, while agricultural tools recall rural life and sustenance. 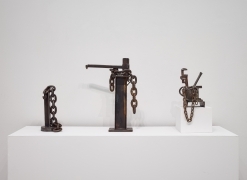 While the landscapes and socio-political dynamics in both Texas and Oklahoma have changed radically since his youth, the contrast of farming and industry remained consistent, and the tools of agriculture are where these multiple histories reside. 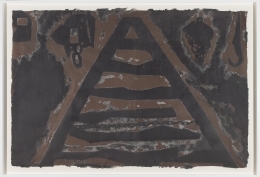 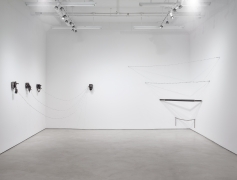 ARK-LA-TEX OK (2016) consists of four individually-made Lynch Fragments, exhibited in a corner of the Gallery, connected to each other by barbed wire, representing a mode of experimentation within his signature metal-welding practice. 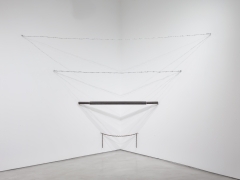 The material contrast creates what the artist describes as distinction between “the mass and the linear.” Edwards activates the architecture around the work through his use of a material that he has frequently referred to as a tool for “drawing in space.” Also on view were recent barbed wire installations, such as Suspended Afterthought (2016/17), which furthers his interest in suspensions as a means of shifting the perception of an environment through intersecting lines and cast shadows. 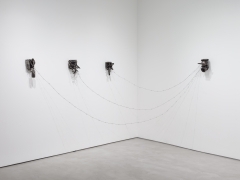 He remarks that with “barbed wire, you have to be aware that it was a way to keep the cows at home. 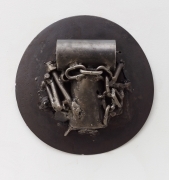 But then people turned it into concentration camps. 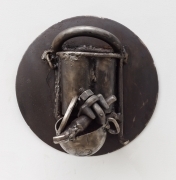 Before it happened with Jewish people in World War II, it happened in Namibia to Herero peoples by the German colonial government prior to WWI. 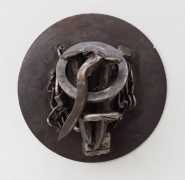 Those contradictions, or contradistinctions are things that have occupied me in visual art. 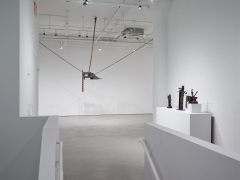 As a way to realize the dynamic in a situation, art or otherwise.” The exhibition included large-scale works on paper, made at the renowned artists’ residency and studio, Dieu Donne Papermill in New York.